A constant plaintiff theme is to attempt to demonstrate that com­munications between a resident’s treat­ing physician and the nursing home staff failed. Plaintiff’s counsel routinely makes the argument that nursing home nurses are the “eyes and ears of the phy­sician” who is not present 24 hours a day in a nursing home. Plaintiff’s coun­sel will often schedule the deposition of a treating physician and inquire as to whether the nursing home staff timely made the physician aware of an issue or if the physician would have liked to have been made aware of an issue. Plaintiff’s counsel is hoping that, in an effort to avoid being sued, the treating physician will turn on the facility and testify that he/she was not timely notified or would have liked to have been notified of an is­sue by the nursing home staff. In order to assist with the de­fense against this type of testimony, the facility must establish a system to en­sure timely communication between the facility staff and the resident’s treating physician. Adequate documentation in the Nurse’s Notes or Interdisciplinary Progress Notes of a resident’s daily con­dition is essential in defending this issue. The most common scenario where this issue plays out is when there is little or no documentation in a resident’s chart and then suddenly there is documenta­tion of a change in condition. Without prior documentation confirming that the resident was status quo just prior to the change in condition, it is difficult to es­tablish that the resident’s treating physi­cian was timely notified of a change in condition. If there is a change in a resi­dent’s condition, the Nurse’s Notes or Interdisciplinary Progress Notes should descriptively document the following: the resident’s condition just prior to the change in status; the time the change in status occurred; any and all nursing as­sessments conducted; the time when the treating physician was notified; a summary of the information that was provided to the physician; receipt and implementation of physician orders; follow-up assessments; and if the phy­sician is not available, and the situation warrants it, the time when 911 was con­tacted and arrived at the facility. Defending against complaints arising from the development of a pressure sore located in the sacrum or coccyx area typically involves determining whether the wound was avoidable or unavoidable. Although we have successfully relied upon the Long Term Care Surveyor’s Guidelines to successfully define unavoidable wounds, the Center for Medicare and Medicaid Services (CMS) recently provided defense counsel with another useful tool when it recognized that a Kennedy Terminal Ulcer (KTU) is not a pressure ulcer and is not caused by poor care. While health care providers have been familiar with the concept of a Kennedy Terminal Ulcer for almost 20 years, formal recognition of a KTU goes a long way in legitimizing the concept that certain medical conditions can lead to unavoidable pressure ulcers that are not indicative of inadequate quality of care. These instructions potentially eliminate (based on resident assessment), reporting new pressure ulcers in persons who are expected to die in Long-Term Acute Care hospitals. The rationale for the requirements recognizes that skin and soft tissue changes associated with aging, illness, small blood vessel disease and malnutrition increase vulnerability to pressure ulcers. In light of these new guidelines, it will be important for MDS personnel to appropriately assess wounds and not code them as a pressure ulcer in the MDS when it is determined that a wound is a Kennedy Terminal Ulcer. In long term care litigation, when presented with allegations that poor care allowed a resident to develop a pressure sore at the coccyx or sacral area, consideration should always be given to whether the wound was unavoidable and, if the wound developed near the end of a patient’s life, using CMS criteria to assist in defining that the wound is a Kennedy Terminal Ulcer and not a pressure ulcer. If a Kennedy Terminal Ulcer is considered, early identification of a knowledgeable expert is essential to assist with developing a theory that the resident was in the dying process. In essence, the expert will need to provide opinions that the resident’s organs and systems were shutting down, including the largest organ, the skin, and this resulted in the development of a coccyx or sacral wound that was unavoidable and was not a pressure ulcer. Health care providers are required to meet the “standard of care” when treating patients and/or residents. So what exactly is the standard of care? Certainly, it is common knowledge that adverse outcomes alone do not equate to negligence. Nevertheless, the vague guidance in the laws of each jurisdiction hardly provide any “black line” guidance as to what a plaintiff must establish to present prima facie evidence of medical malpractice or nursing home negligence. On the other hand, all jurisdictions require expert testimony setting forth the basis for which there was a breach of the standard of care, and that said breach was the proximate result of the injury alleged. Given the number of lawsuits that are filed each year, one could logically surmise that finding an expert to opine that a health care provider “should have” treated a patient or resident “better” is not a difficult endeavor. That being said, hindsight is 20/20. Moreover, the adverse outcomes can and do occur despite the best practical medical care available. In fact, the Federal Code of Regulations and all related state specific codes and statutes recognize this logic-based rule of thumb. Regardless, in defending medical negligence cases, the health care providers are always concerned that the prospective jurors will be substantially prejudiced for the patient when learning of the pain and suffering that will necessarily arise when the disease process becomes terminal. This prejudice can be strong enough to overcome the legal requisites the fact finders are instructed to follow when considering expert testimony on the ultimate issue. Two recent cases offer some reassuring guidance that the courts are willing to hold the plaintiff’s to their evidentiary burden. Specifically, in Chaskes D.O., et. al v. Guittierez1 and Negron v. St. Barnabas Nursing Home2, the appellate divisions of both Florida and New York demonstrated the willingness of the courts to dispose of medical negligence cases where the plaintiffs’ experts could not meet the evidentiary burden relative to implicating liability. The remainder of this article attempts to take a closer look at the facts of these cases, the opinions of the experts, and the results achieved by the health care providers. In Chaskes, the personal representative of the estate of a nursing home resident filed suit against the resident’s treating physician, nurse practitioner, and nursing home. The family contended that each provider was responsible for failing to adhere to the best practices in treating what ultimately developed into a stage IV pressure ulcer. Namely, the plaintiffs presented testimony from two experts: a nurse practitioner and/or plastic surgeon. In essence, the plastic surgeon testified that the manner in which a debridement was performed was not the “best practice” and that an alternative practice would have presented the “best chance for healing”. Further, both experts testified that failing to implement the proper protocol for the wound resulted in a subsequent infection and deterioration that ultimately resulted in the resident’s decline and death. At trial, the defendants moved for a directed verdict. The crux of the motion cited to the trial testimony and concessions of the estate’s surgeon/expert during cross examination. In part, the surgeon was unable to state with certainty whether the pressure ulcer at issue would have progressed differently in the long run had the defendants performed the debridement in a different way. The lower court denied the motion and the jury rendered a verdict in favor of the estate as follows: 65% to the doctor, 25% to the nurse practitioner, and 10% to then nursing home. On appeal, the third DCA of Florida reversed the jury verdict finding that the directed verdict argued by the defense should have been granted. Significantly, the Court held that the estate failed to meet the “more likely than not” standard of causation, relying on two long-standing Florida cases standing for the proposition that Florida Courts impose this burden unlike other jurisdictions that permit recovery for “the loss of any chance of recovery”. The reversal was a three-fold win for the defendants. In other words, in holding that the physician expert did not establish causation, the nurse practitioner and nursing home could likewise not be held responsible as the latter parties were acting in accord with the judgment and orders of the physician. The lesson to be learned in Chaskes is perhaps that the correct questions on cross examination of an expert can, in some cases, take the question of liability away from the jury. Of course, the reality is, as seen in this case, the courts may be more likely to hold the plaintiffs to this burden. By doing so, it removes the case from the sympathetic juror who is often unable to appreciate that a resident’s decline is the result of the natural progression of certain illnesses and not necessarily the result of negligence. In Negron v. St. Barnabas Nursing Home, an appellate court in New York dismissed a claim for nursing home negligence before it could be heard by the jury. Similar to the Chaskes case, the nursing home resident could not present expert testimony substantiating mere conclusory allegations that the resident’s gangrene, skin ulcers, and above the knee amputation were the result of negligence. Although the specifics cited in the opinion are scant, it appears that the nursing home was able to establish, via expert testimony, that the resident’s conditions were the result of long-standing battles with vascular disease, chronic skin conditions, and other pre-existing conditions as opposed to substandard care. The failures are especially troublesome, given plaintiff’s expert’s concession that decedent’s preexisting conditions placed him at an increased risk for the conditions at issue. Moreover, the expert failed to address the evidence supporting vascular involvement and failed to establish the nursing home’s negligence, and not the natural progression of decedent’s diseases and conditions, was a substantial factor in producing the injury. The above recent decisions provide reassurance that the courts will hold plaintiff’s experts to the intended burden of providing more than speculative testimony concerning both negligence and causation. In the grey areas of medical standards, some of the strong language in the respective cases will provide positive support when dealing with similar blanket and baseless expert opinions. 1 Chaskes D.O., Sandra Sanit-Eloi, ARNP and Vohra Halth Services, P.A., Appellants v. Zoila Guitierrez, as Personal Representative of the Estate of Dilia Dolores Jaquez, Appellee, 2013 WL 1980214 (Fla. 3d DCA 2013). FINRA, the largest independent regulator for securities firms doing business in the United States, has significantly increased enforcement actions and fines since the Financial Crisis in 2008. FINRA levied $68 million in fines in 1,541 cases against firms and registered individuals in 2012, up from $28 million in fines in 1,073 cases in 2008. That is a 59-percent increase in fines and a 30-percent increase in actions over this four-year period. The good news for firms: investor-related litigation has dropped from its peak in 2009, after the financial crisis. In 2009, 7,137 arbitration claims were filed with FINRA Dispute Resolution, compared to 4,299 in 2012. This is a 40-percent decrease over a three-year period. We anticipate these litigation trends will continue until the stock market shows reduced returns or there is another significant economic slowdown. However, under certain circumstances, Florida law allows employees to pursue a general liability claim against an employer and an employee can sue his employer for an intentional tort. An employer is not entitled to workers’ compensation if the employer causes the employee to fail to timely file a claim. Late last year, the Third District Court of Appeal allowed an employee to file a general negligence claim against his employer for a work-related injury because the employer had concluded that the injury was not incurred during the course and scope of employment, and had failed to timely report the injury to the carrier, resulting in a denial of the claim. When the employee made a claim against the employer for general negligence, the employer asserted that it was entitled to immunity under the workers’ compensation laws and filed a motion for summary judgment, which the rial court denied. On appeal, the appellate court affirmed, stating that “it would be inequitable for the employer, through its insurance carrier, to take the position that there were no work-related injuries and hence no workers’ compensation coverage, and then later, when the employee brings a tort action against the employer, to assert as a defense at law that there was workers’ compensation coverage entitling the employer to immunity from suit. As the employer may not separate itself from its compensation carrier’s determination that the employee’s injuries did not occur during the course and scope of employment, the employer is estopped from taking the totally inconsistent position that the injuries did occur during the course and scope of employment and claim worker’s compensation immunity when sued in tort.” Ocean Reef Club, Inc. v. Wilczewski, 99 So. 3d 1 (Fla. 3d DCA 2012), reh’g denied (Oct. 16, 2012). Accordingly, when evaluating an employee’s general liability claim against an employer, it is necessary to investigate the existence of workers’ compensation insurance, whether a claim was made to the workers’ compensation carrier and, if the claim was denied, whether the employer’s representations to the workers’ compensation carrier were inconsistent with those made during litigation. Workers’ compensation immunity does not always preclude an employee’s intentional tort claim. Under the current workers’ compensation statute, which was amended in 2003, no cases have satisfied the required elements to make a claim for an intentional tort. The conduct was a legal cause of the employees’ injury or death. Two recent cases which specifically discuss the elements of an intentional tort as defined within the 2003 statute include List Indus., Inc. v. Phiteau Dalien, 107 So. 3d 470 (Fla. 4th DCA 2013), and Gorham v. Zachry Industrial, Inc., 105 So. 3d 629 (Fla. 4th DCA 2013). In List Industries, the Fourth District overturned a $2.7 million verdict for the plaintiff and granted the employer’s motion for directed verdict because the employee failed to present “clear and convincing evidence” of each of the three indispensable elements in section 440.11(1)(b)(2), Florida Statutes (2005). The appellate court recognized the 2003 change to the workers’ compensation statute and noted that the change from substantial certainty to virtually certain was an extremely different and a manifestly more difficult standard to meet. It would mean that a plaintiff must show that a given danger will result in an accident every — or almost every — time. The court also commented that, given the stringent standard required to overcome an employer’s statutory immunity, the case was amenable to being decided on summary judgment. The history of the workers’ compensation system demonstrates that the legislature intended to give coworkers and employers immunity from suit except in extraordinary situations. Such immunity not only limits the expense of doing business in Florida over and above the admittedly significant expenses of the workers’ compensation no-fault system, but also helps maintain a better work environment in which coworkers are not constantly in fear of being sued by their fellow employees. The legislature has thus created an exclusive, administrative, no-fault remedy that is unaffected by comparative negligence in exchange for broad immunity from lawsuits for employers and coworkers. The goal of this policy is to avoid lawsuits at the outset, not simply to prevent adverse verdicts against employers and coworkers at the end of lengthy litigation. If the trial courts are to foster these legislative policies, they must serve as gatekeepers at the initial stages of litigation. Id. at 473-74. In Gorham, meanwhile, the Fourth District upheld the trial court’s order granting the employer’s motion for summary judgment stating, “we agree with the trial court that, based upon the narrow exception adopted by the Legislature, an employer must know that its conduct is virtually certain to cause injury, or the employer is entitled to immunity.” The appellate court recognized that the newly enacted virtual certainty standard was even more stringent than substantial certainty. Id. at 633-34. Mr. Gorham was working as a rigger on the FPL power plant construction site when he was injured. On the day of the accident, the crew was attempting to lift and place a nine-ton wall. Two cranes were available to lift the large pre-fabricated wall into place. A tag line to keep the wall from swaying as the crane lifted the wall was attached to the wall, and because of the danger of swaying, attention to the wind speed was very important. On the day before the incident, the general foreman cancelled this lift because the winds were over 20 miles per hour. The foreman testified that a lift would not occur if the winds exceeded 18 miles per hour. At the time Mr. Gorham was injured, he relied upon his foreman to decide whether to proceed with setting the wall and, based upon the foreman’s decision to move forward, believed that the wind was fine; however, it seemed to Mr. Gorham that the wind was blowing at approximately 30 mph. In determining that summary judgment was appropriate, the court reasoned that there must be evidence that Zachry, through its foreman, knew that the wind speed was in excess of what was safe to perform the lift and that lifting in that condition would with virtual certainty produce injury or death. While there was a dispute as to whether the foreman even took wind readings, taking the evidence in favor of Gorham, it could be said that the foreman did not take the wind readings and allowed the lift to occur not knowing what the wind speed was; however, there was no evidence that such a lift would with virtual certainty cause injury. That afternoon the lift was performed without any injuries, even in increasing wind speeds. The court reasoned that the employer’s conduct may have been grossly negligent, but it was not intentional. Dalien and Gorham were examined in the recent Fourth District case of Boston ex rel. Estate of Jackson v. Publix Super Markets, Inc., 112 So.3d 654 (Fla.4th DCA 2013) the Fourth District affirmed a summary judgment in favor of the employer supermarket on the basis of Dalien and Gorham, finding that the plaintiff had not met the burden placed on him by the statute to show that “a given danger will result in an accident every—or almost every—time.” Boston, 112 So.3d at 657. 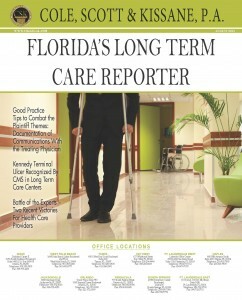 Based upon recent case law, if an employee makes a claim for an intentional tort, the employer should mount an immediate and aggressive response as Florida courts—especially the Fourth District and the Third District—have clearly identified that there is a very narrow exception to the protection of workers’ compensation immunity. 1 Fla. Stat. § 440.015 (2013). 2 See United Parcel Service v. Welsh, 659 So. 2d 1234, 1235 (Fla. 5th DCA 1995); 2 Arthur Larson & Lex K. Larson, Larson’s Workers’ Compensation § 65.10 (Desk ed. 1999). 3 Fla. Stat. § 440.09(1) (2013); see also Fla. Stat. § 440.11 (2013). 4 Turner v. PCR, Inc., 754 So. 2d 683, 686 (Fla. 2000), superseded by statute, Fla. § Stat 440.11 (2003), as recognized in Gorham v. Zachry Indus., Inc. 105 So. 3d 629 (Fla. 4th DCA 2013) (this paper discusses, among other changes, the intentional tort exception change of standard from “substantially certain” to “virtually certain”; however, the overall scheme of immunity from common-law negligence remains in effect). 5 “Clear and convincing evidence” is evidence that is precise, explicit, lacking in confusion, and of such weight that it produces a firm belief or conviction, without hesitation, about the matter in issue. Florida business owners received a helpful ruling from the Third District Court of Appeal in Kenz v. Miami-Dade County, 116 So.3d 461 (Fla. 3d DCA 2013). This case was the first opinion from a Florida District Court of Appeal to address head-on whether section 768.0755, Florida Statutes, may be applied retroactively, as a procedural statute, to cases pending when it was enacted. The case held that “section 768.0755 is procedural in nature, and applies retroactively.” The Third District therefore affirmed the grant of a summary judgment in favor of the county, in a case where the plaintiff had fallen at Miami International Airport. The court found that section 768.0755 returned Florida law to its status pre- Owens v. Publix Supermarkets, Inc., 802 So. 2d 315 (Fla. 2001), “and provides that a person who slips and falls on a transitory foreign substance in a business establishment1 must prove that the business establishment had actual or constructive knowledge of the dangerous condition and should have taken action to remedy it.1” Kenz, 116 So. 3d at 463 (citing Fla. Stat. § 768.0755 (1)). The Third District opined that the statute superseded section 768.0710, Florida Statutes, even for pending claims. Under that superseded statutory section, actual or constructive knowledge of the transitory foreign substance or object was not a required element of proof of a plaintiff’s negligence claim. Thus, section 768.0755 will mean that an injured party must show more than that a business “should have” known of the existence of a dangerous condition—a plaintiff will have to show actual (or constructive) knowledge. 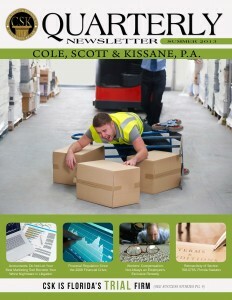 However, Cole, Scott, & Kissane P.A., is currently involved in an appeal of the same issue, in a condominium slip-and-fall case in which an appeal of a jury verdict is pending in the Fifth District. There are two primary issues raised in the Initial Brief filed on behalf of the condominium client: (i) whether section 768.0755 should or may be applied retroactively and (ii) what standard of proof/burden of proof does it require a plaintiff to meet at trial? A sub-issue is whether section. 768.0755 (which repealed section 768.0710) is procedural or substantive in nature. The Initial Brief has been filed, but the Answer Brief has yet to be filed. 1 In fact, the Third District later issued a per curiam affirmance citation opinion, in Garland v. TJX Companies, Inc., 114 So. 3d 298 (Fla. 3d DCA 2013), affirming a summary judgment in favor of a business defendant, and affirming an order denying leave to amend the plaintiff’s complaint, citing to Kenz. 2 In a recent order granting summary judgment, the Middle District of Florida (Trial Court) in May adroitly evaded the issue of which version of the statute would apply. See Oken ex rel. J.O. v. CBOCS, Inc., 8:12-CV-782-T-33MAP, 2013 WL 2154848 (M.D. Fla. May 17, 2013) (“This Court need not determine which statute applies in the instant case, in which the cause of action accrued before the repeal of section 768.0710, because the Court finds that Cracker Barrel’s Motion for Summary Judgment is due to be granted regardless of which burden is imposed upon Oken in this negligence action. Specifically, summary judgment is appropriate because the record is undisputed that Cracker Barrel did not breach its duty to Oken”).